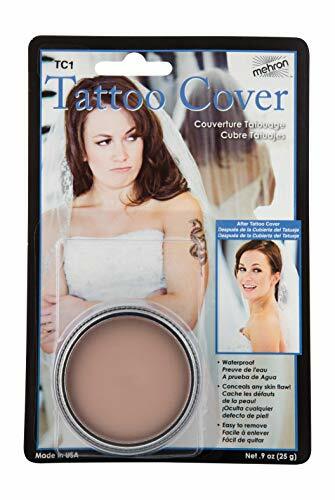 Mehron Tattoo Cover uses a creamy formula designed to help mask tattoos, birthmarks and skin discolorations. Goes on smoothly and evenly. Available in a variety of colors and a 5 color palette. Choose the Tattoo Cover shade closest to skin tone and apply with a sponge using a patting, not a stroking motion. Set with Colorset Powder using a Powder Puff. Remove with Makeup Remover followed by soap and water. Artist Tip: Once Tattoo Cover is set, apply cream makeup over Tattoo Cover (again with a patting motion). Press Colorset Powder using a Powder Puff into final makeup design. Mist Barrier Spray over area to seal and protect final makeup application. Women's Wrist Gloves - available in 30 different Colors !